Powdery mildew (Leveillula taurica) is most prevalent in warm, dry atmosphere. The optimum germinating temperature is approximately 25°C with humidity ranging between 50 – 75%. 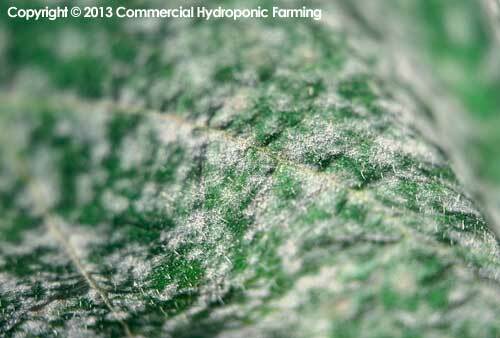 It is quite common for inexperienced growers to identify powdery mildew as downy mildew. The most important differences are powdery mildew are found in summer and on top of leaves. Downy mildew is found on the underside of leaves and in wet cold (winter) conditions. Downy mildew is quite commonly found of lettuce leaves. The symptoms are similar to powdery mildew found on other crops. There is abundant powdery white growth on the upper surface of the leaves. The powdery growth forms circular to irregular areas that are ¼” or more in diameter. The lesions are often associated with some leaf yellowing. Eventually the affected tissue will brown and die. This disease usually begins on the lower leaves and progresses up the plant. Entire fields may go down in a short period of time. Disease more prevalent in tomato production under protection. • Optimal cultivation ensures healthy plant with a lower chance of infection. • Identify the disease early and follow a weekly spraying program with registered fungicides. Powdery mildew (Leveillula taurica) is most prevalent in warm, dry atmosphere. Characterized by abundant powdery white growth on the upper surface of the leaves. The powdery growth forms circular to irregular areas that are ¼” or more in diameter. The lesions are often associated with some leaf yellowing.